In his excellent book, The Hunt for the Skinwalker, George Knapp relates the idea of quantum physics’ “many-worlds interpretation” (MWI), or “multiverse theory” in a commonly styled, sensationalist way; that is, anything and everything you can imagine, no matter how outrageously absurd or mundane, exists in another dimension. I recently heard him relate the same notion while he was hosting Coast to Coast. The examples he gives are meant to be funny, absurd, to make the point of the theory’s bizarre factor. I really don’t mean to pick on Knapp; I have heard these same ideas many times before. But, after hearing him repeat the notion, I decided to search for some deeper understanding. Although I don’t recall Knapp’s exact examples, they are along the lines of: in another world, everyone walks on their hands instead of their feet, George Knapp is married to Carmen Electra, monkeys type screenplays all day long, etc. In other words, it’s Bizarro World. It just strikes me as too quaint, convenient and contrived. I have a feeling this understanding is simply an example within a much more meaningful and thoughtful idea, and that it somehow misses the point. An example, or sensational encapsulation like this within a philosophical point, may help in conveying and understanding its meaning, but there is a danger of that common understanding replacing the original philosophy. Take Plato’s theory of Forms. I sat through countless lectures in philosophy and humanities classes, and in every single Plato lecture, the professor droned on about the Form Chair or the Form Table. According to Plato, somewhere in the ethers, declared these professors, there is one perfect essence of Chair, one perfect Table, from which all earthly or other chairs and tables are shoddy imitations. I pictured a perfect, fabulously glowing white dinette set on the uppermost and neglected floor of some ethereal Sears. Obviously, this example, by using tangible common objects—might at some point been a great analogy to express the idea of Forms. Unfortunately, the Platonic Chair and Table have become a somewhat of an easy academic meme, and the real point is missed. The actual examples of Forms that Plato gives are abstractions: Truth, Beauty, Justice, Equality and the like. The Forms are irreducible things that make up an object or a thing. The Forms are things that are hard or impossible to describe without using the term itself in the description; it can almost be seen as doctrine comparable to Sacred Geometry. The Table and Chair fit within the discussion, but not as Forms; they actually better express the Platonic ideas of Particulars and Participation within the Theory of Forms. I think the Bizarro World is Plato’s dinette set of the multiverse. Appropriate in itself on some level perhaps, but not the main attraction or real point of understanding. The Bizarro World might be the most attractive bit of the multiverse theory; it speaks right to our seemingly ancient need to address and explore Otherness. However, looking at the multiverse theory exclusively through this lens doesn’t paint a full or realistic picture. There is an idea that worlds split off only at a most basic micro level, and not necessarily by whether I decide to have a salad or rice for dinner, nor whether or not a fly lands on my nose, nor at the proverbial fork in the road. Reality branches with (apparently) non-human consciousness, non-meaningful quantum triggers and adjustments that may be only casually associated with our larger expressions, or perhaps maybe even not at all. Just because our perception registers something as an apt event or loaded choice, doesn’t mean it is. This is quantum theory after all—the micro, not the macro. Of course, there are many debates over the relationships between the micro and macro; the strange, virtually imperceptible quantum world, over our classic and everyday perception and experience. I wonder if “meaning” can or should be extracted like this, how different the different branches of the universes really are. Within the MWI, there’s even an idea that the different branches can and do sometimes merge together once again. If this is so, how different can the previously branched universes really be? And could the respectively small historical or perceptive discrepancies even perhaps account for some paranormal phenomena or high strangeness? Also, if high meaning is extracted from the equation, it fairly negates the notion that there’s a parallel world in which every single person has opted to receive plastic surgery to look like the late game show host Gene Rayburn, and eats grubworms at every meal. Exactly where did this quite postmodern idea of any-crazy-thing-you-can-think-of has a place in the multiverse theory anyway? In no way do I mean to imply there is a lack of diversity in the other universes, but the examples commonly given in lay discussions seem quite inflated. Within the MWI, it’s commonly stated that all possible branches of history and experience are realized. I understand quite well I may be completely incorrect, but how is the idea of possibility defined? But, again removing the idea of “meaning,” how are we to know what those possibilities are, or on what kind of scale they are/would be realized? It seems to me this pop aspect we’ve latched onto within the MWI may be little more than what I mentioned earlier; our very human need for meaning and understanding of Self, expressed in a creation of Other. 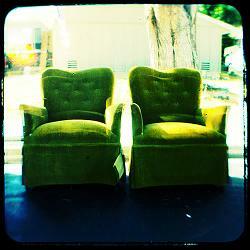 Photo credit: Two Green Chairs by rustman at flickr.com; used via creative commons licensing.